Prototype: German Federal Railroad (DB) class 89.70-75 tank locomotive. Former Prussian T 3 branch line locomotive. 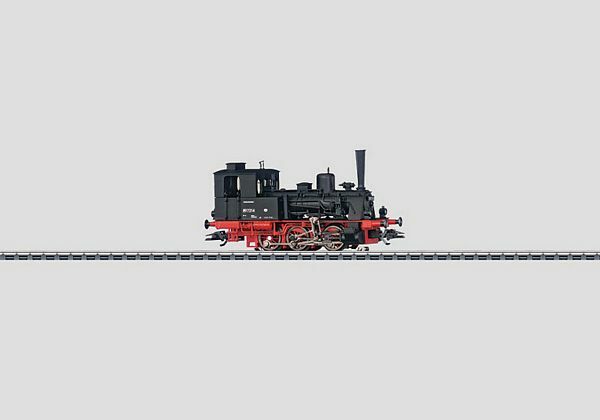 Model: The locomotive comes with a digital decoder and controlled propulsion. It has a miniature can motor in the boiler. 3 powered axles. Traction tires. The locomotive has detailed running gear with a representation of the Allan valve gear. The headlights will work in conventional operation and can be controlled digitally. There is an unobstructed view through the engineer's cab. The locomotive has many separately applied details. Length over the buffers 9.9 cm / 3-7/8. In 1882, Henschel delivered the first example of a saturated steam locomotive with 6 driving wheels for branch line service. The T 3 impressed people with its easy maintenance, robustness and versatility. The jury at the Chicago Worlds Fair in 1893 was also convinced. It awarded a prize to this 11 year old design. Even 13 years later locomotive builders were still bold enough to exhibit the T 3. In Milan, Hanomag presented the last locomotive, equipped with a Lentz poppet valve system as an experiment. The exhibition efforts paid off for the companies involved. Locomotives of similar design went to China, France, Greece, and Italy. The German State Railroad designated it the class 89.70. In Germany, in addition to the Prussian State Railways, numerous private railroads purchased the T 3. Starting in 1891, the Royal Wurttemberg State Railways also joined the group railroads running the T 3. The first units for this railroad were built by Krauss in neighboring Bavaria. After that, additional locomotives came from Wurttemberg builders, the Maschinenbau-Gesellschaft Heilbronn, and Machinenfabrik Esslingen. The running gear on the Wurttemberg locomotives was designed for more power, and the wheel diameter was somewhat smaller. Instead of the outboard mounted Allan valve gear, they were equipped with Heusinger valve gear. They ran on the German State Railroad as the class 89.3. Several units of both classes survived to be used by the state railroads of both East and West Germany after 1945. Road numbers 89 7296 and 7377 were the last units retired by German Federal Railroad in 1961.